The start of Lucas life was a little rough when he rescued in a rural area of Saskatchewan, not able to breathe on his own. 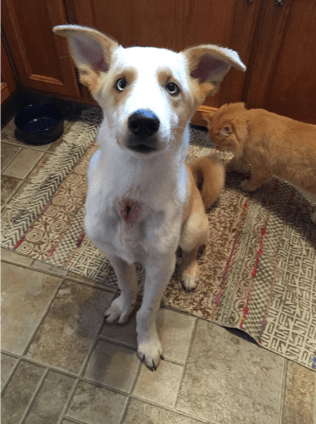 A veterinarian did a tracheotomy to save Lucas’s life. NHDR was contacted to determine if NHDR could follow up on his care. Lucus was seen at the Veterinary Medical Centre to be assessed and to be treated for pneumonia. Lucas will need to have surgery when he reaches one year old which will further help his breathing. Lucas is a very happy and energetic young dog that does not let his condition slow him down. He does require additional care than your typical puppy, but his foster is very committed to him. Please consider donating to help with Lucas’s medical expenses. Any donation would be greatly appreciated. Update Lucas found a very special family to adopt him in January 2018!